bSix12 – Do what makes you happy! » Jeff Hawkins: What is the Source of Intelligence? While Jeff Hawkins was creating the Palm Pilot, launching the era of handheld computing and amassing hundreds of millions of dollars, a big part of his mind was somewhere else: His true passion is something entirely different. It is an Einstein-worthy puzzle that has fascinated scientists for centuries: What is the source of intelligence? Understanding the human brain and designing truly intelligent machines has been a lifelong passion for him. In his book On Intelligence, Jeff Hawkins together with New York Times science writer Sandra Blakeslee takes a detailed look at how the human brain works, compares this to how AI currently works and explains his memory-prediction framework theory. The book starts with some background on why previous attempts at understanding intelligence and building intelligent machines have failed. I then introduce and develop the core idea of the theory, what I call the memory-prediction framework. In chapter 6 I detail how the physical brain implements the memory-prediction model—in other words, how the brain actually works. I then discuss social and other implications of the theory, which for many readers might be the most thought-provoking section. The book ends with a discussion of intelligent machines—how we can build them and what the future will be like. Today’s computers can solve problems in seconds that require hours or days for a person. Yet even a child can recognize a familiar face and understand speech, while the most advanced computers struggle with those tasks. Hawkins thinks scientists working in AI and neural networks have focused too much on inputs and outputs rather than the neurological system that connects them: "Many people today believe that AI is alive and well and just waiting for enough computing power to deliver on its many promises," Hawkins says. "I disagree. AI suffers from a fundamental flaw in that it fails to adequately address what intelligence is or what it means to understand something." "Why can a six-year-old hop gracefully from rock to rock in a streambed while the most advanced robots of our time are lumbering zombies?" Hawkins asks. "Why are three-year-olds well on their way to mastering language while computers can’t despite half a century of programmers’ best efforts? Why can you tell a cat from a dog in a fraction of a second while a supercomputer cannot make the distinction at all?" The answer, as Hawkins and Blakeslee demonstrate, is that the human brain doesn’t compute answers to problems; it retrieves answers from memory. While it takes many steps to compute something, it takes only a few steps to retrieve it from memory. The seat of human intelligence, where all this memory storage and retrieval takes place, is the neocortex, the pinkish- gray mass that looks like a cauliflower. The key to understanding what intelligence is, is in understanding the cortex. By using many easy-to-understand examples Hawkins and Blakeslee do an outstanding job of explaining the organizational architecture of the neocortex and the intricate way in which its six layers of cells are connected. "The neocortex isn’t made of superfast components, and the rules under which it operates are not that complex," Hawkins says. "However, it does have a hierarchical structure that contains billions of neurons and trillions of synapses. If we find it hard to imagine how such a logically simple but numerically vast memory system can create our consciousness, our languages, our cultures, our art, this book, and our science and technology, I suggest it is because our intuitive sense of the capacity of the cortex and the power of its hierarchical structure is inadequate." Hawkins’ basic premise is that the human brain is a memory-prediction system for modeling the world around it. The brain stores and recalls experiences, relates them to other experiences and uses the memories of these accumulated experiences to make predictions. This ability to predict is the heart and soul of human intelligence, he says. It can also help explain phenomena such as consciousness, imagination and prejudice, or to answer such elusive questions as, What is reality? As to the question of whether we can build truly intelligent machines, Hawkins believes the answer is yes, but those machines won’t be the humanoid robots we’re used to seeing in films like "I, Robot." Hawkins offers his own intriguing ideas on how truly intelligent machines might be like, but to find out more about this you have to read the book. Jeff Hawkins is now co-founder of Numenta – a startup dedicated to create a new type of computing technology based on his theory described in the book On Intelligence. 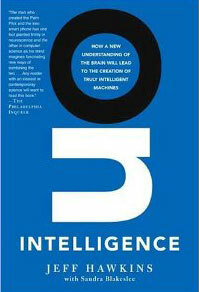 If you have any curiosity at all as to how your brain works, read On Intelligence and you’ll be hooked. It is by far the best book on this topic. You can read the prolog here.